The Harborside Mansion that was brought in to us is gorgeous. Such beautiful exterior colors! The interior is still bare which is why the customer brought it to us. She wants me to finish the inside with wallpapers and floorings and light fixtures she has picked out. Sounds like a straightforward, easy job. But this Harborside had a pre existing condition: the electrical. Customer hired a friend to do the electrical. There are parts that were cleverly done (attaching each level to it's own individual on/off switch at the foundation) and other parts that were done without thinking ahead to the next step. 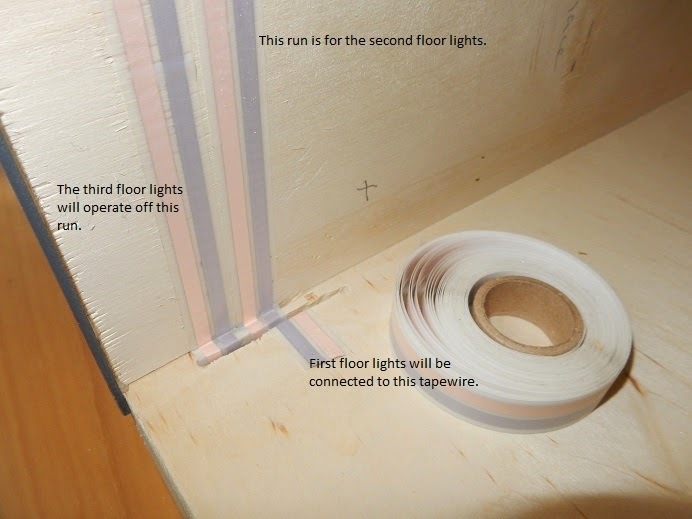 Such as the bulk of wiring being brought up to the different levels of the house. Since each level is on it's own switch, each level needed a run of tapewire brought up the wall. 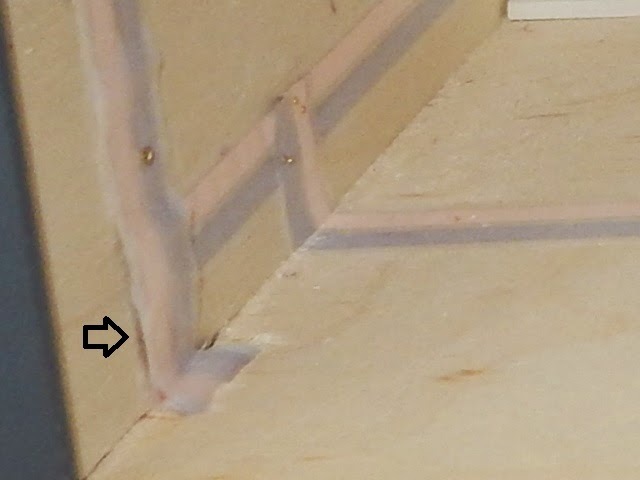 Rather than run them side-by-side, the electrician ran them one on top of the other, creating a bulky wad which would look terrible under the wallpaper/flooring and possibly even break when I try to fit the papers/flooring tight to the corners . . . But I simply couldn't remove the wad and tie them all to one run because underneath the foundation, the three different tapewire runs were connected to their individual switches! The switches to operate each floor's lighting. and must be kept on separate runs as it enters the house. So I cut out the wad, separated the 3 different tapewire runs under the house (you can see I've already done that in the photo above) and wired them to new runs going into the house that aren't layered one on top of the other. Each level now has it's own run that lays flat on the wood. No more bulk that will look awful beneath the wallpapers/floorings! The other electrical issue involved the chandeliers. On the first and second levels, the customer wants the ceiling lights wired to the floors above. But friend wired house with tapewires across the ceilings. So we will be removing the ceiling wiring and running the wires across the floors above (yet still keeping them to the proper run so that they still turn on/off with the rest of the lights on their respective levels: don't want a chandelier on the first floor to stay on when all the table lamps gets turned off by the switch!). Once this electrical is all sorted out, we'll start priming/painting some rooms and installing wallpapers, floorings, fixtures, and staircases in some other rooms! Stay tuned! 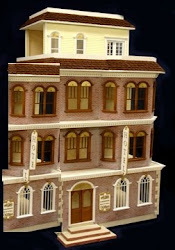 This dollhouse originally came in to be converted into a true Colonial (centered front door with symmetrical single windows on either side). However, the siding is individual strips glued onto compressed wood so removing, cutting and replacing the different components would involve a great deal more labor (and cost) than the customer wished to spend. So she opted to have us do minor architectural repairs and changes. Customer will then remove the interior wallpapers and re-wallpaper the dollhouse for her granddaughter. the rooftop porch needed railings. BEFORE: Mullion is broken in lower left hand of the window. AFTER: Quick and easy fix! Biggest change and hardest work to complete was cutting the archway from the kitchen to the living room. I love the I-drill and it usually is a quick cut to create windows, doorways, and other holes where needed in a wall. However, the I-drill handle wouldn't fit in the room properly and the I-drill would not cut along the curve of the archway. Plus, the wall is a compressed wood product that splinters and shatters when cutting. This turned into a slow process of cutting out chunks and filing away the excess wood and then sanding the splinters and jagged bits away. Luckily the customer is putting Unique Miniature's arch trim on the walls so we did not have to make a perfect cut (which greatly reduced the labor time) . . . .
BEFORE: Kitchen in need of an arch doorway on the right wall. 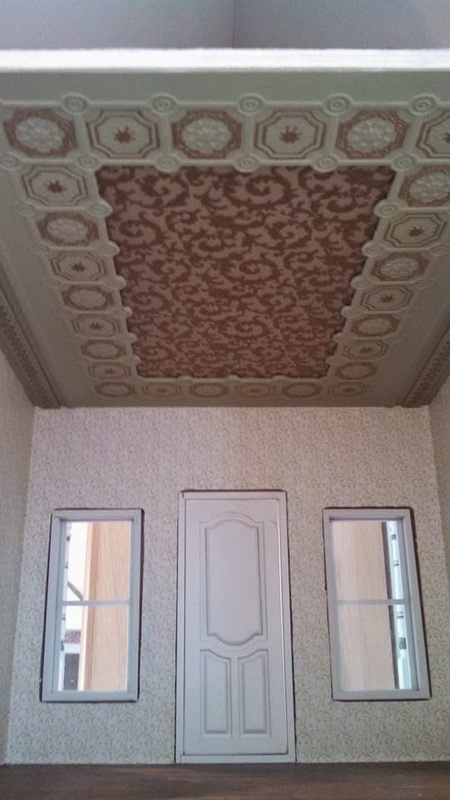 old wallpapers; then she will install the arch trim (see photo below). once customer removes the old paper and gives the walls a fresh finish. AFTER: Shingles replaced in various spots and along the edges of the roof. BEFORE: This rooftop porch is not to code. AFTER: Another quick and easy fix that really completed the house. Now on to the Harborside Mansion decorating job, the Contemporary Ranch (very excited about a glass block half-wall this house is getting), and a Dutch-style dollhouse we worked on in 2009 that has been returned for wallpapers and electrical work! This week I've been working on minor little projects. I wired 2 roomboxes for a customer. I created a ceiling for a store display. And I added a few more photos to my online store. It was a very easy ceiling to make. I am too busy at the moment to cut strip woods and crown moldings to create a drop, tray, or Victorian, ceiling. World Market has this paper/Styrofoam ceiling product. It is supposed to be a "tin" ceiling, and it is paintable! of my sheet to create the layer look in the ceiling. 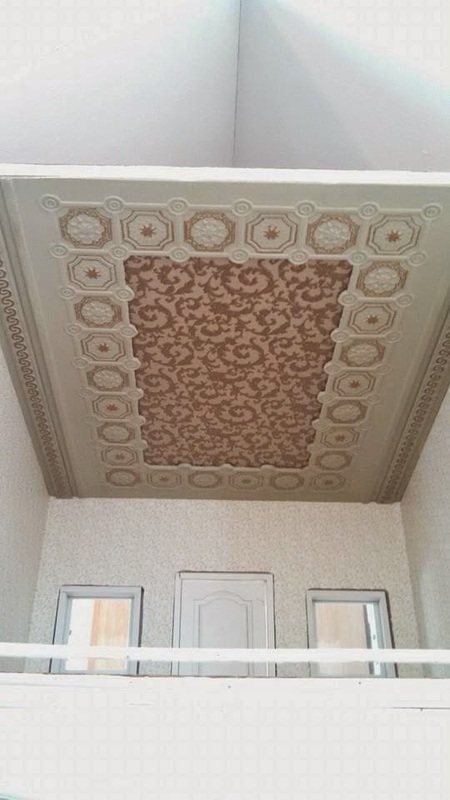 I didn't want to put the full sheet on the ceiling: I wanted it to look more Victorian and their ceilings frequently have murals or paintings or other designs in the center of their ceilings. So I cut out the center of my 'tin' ceiling sheet (I should have had patience and used a sharp exacto knife, but I wanted to finish it in one day so I used a dull blade and it did rip my edges a little bit but luckily it didn't show too much once I painted it). Then I painted the sheet sage green to match the decor of the house. 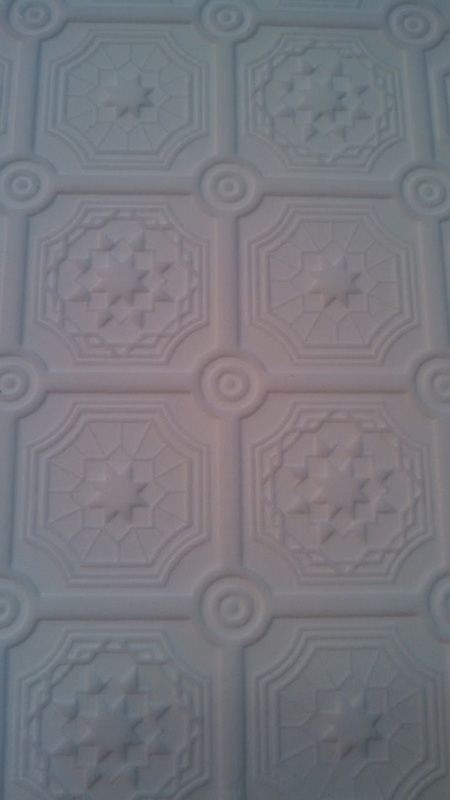 But the delicate, interesting design on the ceiling doesn't pop out when it's all white or all sage green . . . The detail on the tin ceiling is amazing, but hard to see. Highlighting the detailing on the ceiling sheet. I used various color Sharpies on this scrap piece. So I used a Metallic Gold Sharpie marker to outline all the detailing on the sheet. But the center of my ceiling was still painted white and I couldn't decide how to finish it off: just painting it gold was too plain when compared to the rest of the ceiling and putting a mural in that spot didn't match the color scheme. 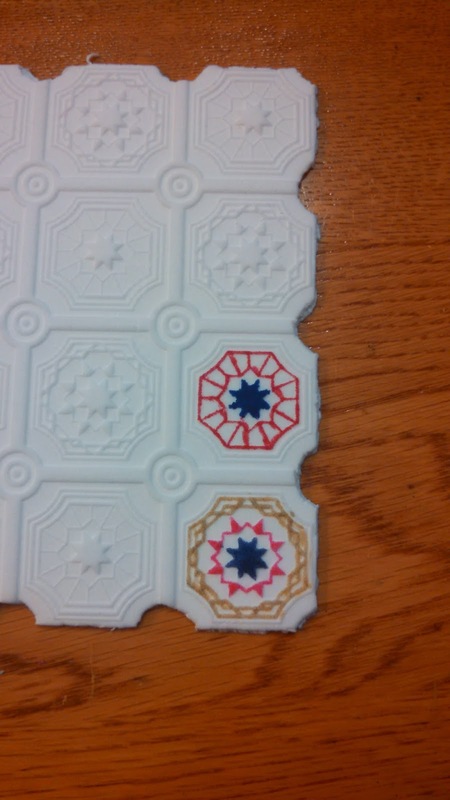 I considered painting the center gold and putting a medallion in the center to dress it up. But then I found a scrap of some wallpaper left over from when I worked on the customer's Versailles palace last year. It was the exact shade of gold as my Sharpie marker and it was the exact size I needed to fill in the center rectangle! 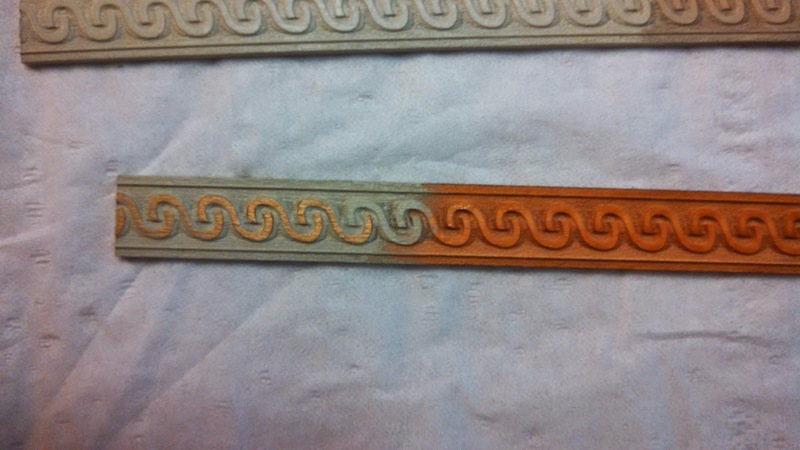 These wood trims had a similar pattern as the center wallpaper! 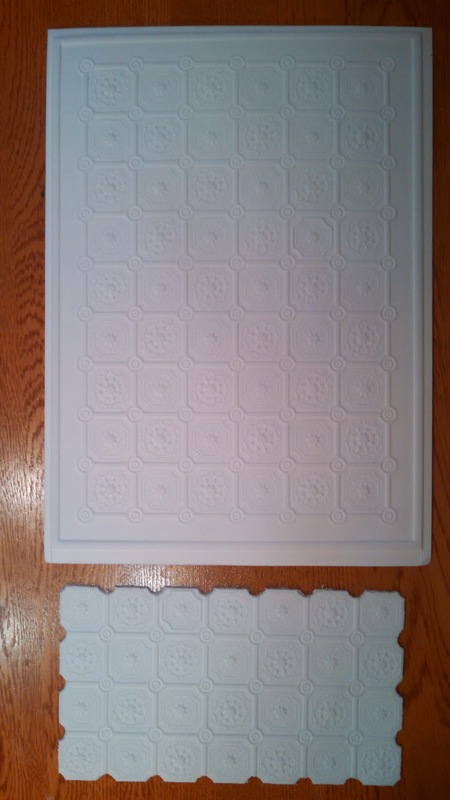 So I glued all the components on to the display dollhouse ceiling. All total, including paint drying time, it took less than a day to do.